This was an amazing read. I don't have a lot to say, because, well...just, wow. I knew from what I'd already heard about this book that I'd love it and find it inspirational, even though I wasn't too very familiar with its subjects. I knew that Robert Mapplethorpe was a controversial, gay photographer who had died of AIDS. I knew of Patti Smith from "Dancing Barefoot," and "Because the Night," and that Gilda Radner character satirizing her, back in the late '70s. I knew that in the realm of punk, she was the goddess, much like Joni Mitchell is with the L.A. songwriting scene. 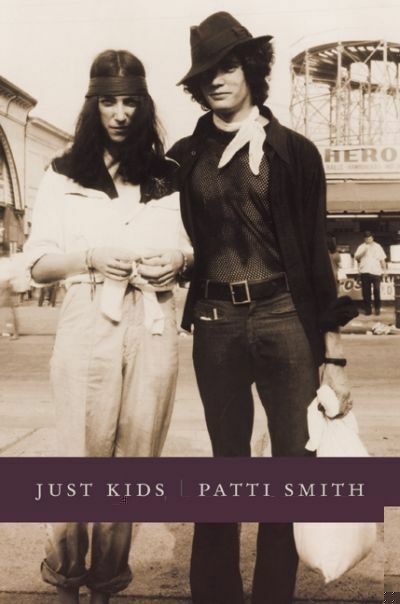 What I didn't know was that Patti & Robert were best friends, lovers, instigators, inspiration and muse for each other. 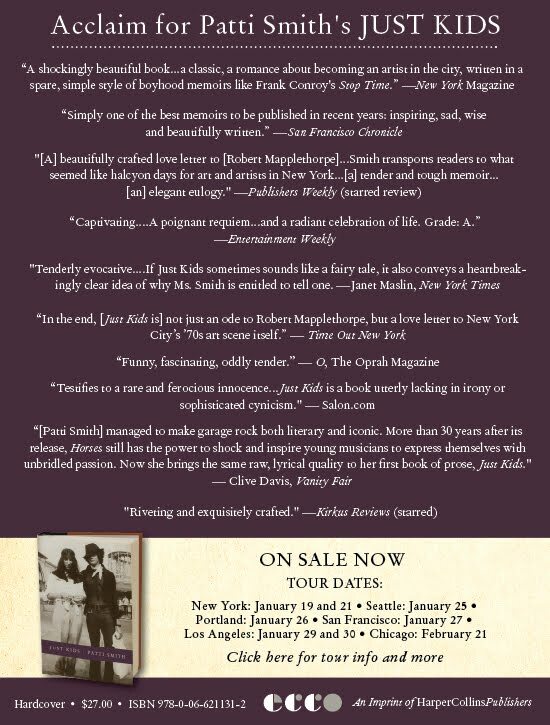 So, contained within: Arthur Rimbaud. Baudelaire. Warhol. Allen Ginsburg. Jim Carroll. Sam Shepard. Encounters with Jimi and Janis and an early visit to Morrison's grave. Gerard Malanga. Burroughs. Blue Oyster Cult (!) The Chelsea Hotel, CBGBs. Art as lifestyle, art as life. This memoir drips New York City, and the city is the other major character here. I've mentioned before that I've never been to New York, never travelled further east than the Deep South. Geez. I feel like such a rube. Suburban hick with a graduate degee and I don't know nuthin' about nuthin', much.